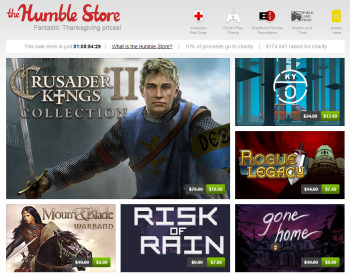 The curators of the Humble Bundle are cutting prices on Mount & Blade: Warband, the Crusader Kings II Collection, Rogue Legacy, and more. The Humble Store announced its Thanksgiving sale yesterday with deals on 18 games. The sale puts the Humble Store in competition with other holiday deals, including the Steam Autumn Sale. While many of the games on offer from the Humble Store match the Steam Sale prices, others offer a greater discount. The Crusader Kings II Collection stands out at $19.99 USD, marked down from $79.99 and priced at $39.99 on Steam. The Steam price could drop later on a daily deal or flash deal. Another great deal is indie action RPG Mount & Blade: Warband, marked down 75% to just $4.99, five dollars less than Steam is currently offering. The Humble Store launched earlier this month to provide a permanent storefront for the Humble site. Proceeds from the store are split between charity (10%), the game creators (75%), and the Humble tip (15%), which goes to cover hosting and other costs. The charity proceeds are split equally between the American Red Cross, Child's Play Charity, Electronic Frontier Foundation, World Land Trust, and charity: water. The Humble Store offers daily deals on the games in store, in addition to the pay-what-you-want Humble Bundles and Weekly Sales. These prices end at 2 p.m. EST on Friday, November 29, so don't let tending to in-laws or cooking a turkey keep you from taking a look. The titles are available on PC, Mac, Linux, and some on Android. Full system requirements for each game are listed on the Humble Store.